This is a story about a snow-covered island you won’t find on any map. It’s the story of a girl, Minou. A year ago, her mother walked out into the rain and never came back. It’s a story about a magician and a priest and a dog called No Name. It’s about a father’s endless hunt for the truth. It’s about a dead boy who listens, and Minou’s search for her mother’s voice. It’s a story you will never forget. I hadn’t even heard of The Vanishing Act when I walked into Waterstones one lunchtime but there is something about that synopsis that I find strangely beautiful. It doesn’t hurt that the cover of the paperback edition that I own is adorable – some of the little stars that you can see in the picture are all shiny and silver or blue. I know that we shouldn’t do such terrible things as judge books by their covers but, in this case, it worked out superbly well. On the face of it, this is a very simple story about Minou’s life on the tiny island she shares with her father, a priest, a magician and his dog (No Name) and a peacock. More than that, though, it’s about a 12 year old girl trying to come to terms with the fact that her mother isn’t around, trying to bond with her father as he also struggles with his past and trying to make sense of the confusion of adults around her. We only ever get to see the other characters through Minou’s eyes, which means that most of what we learn about them is from how they treat her. Her father, for example, seems intent on raising a philosopher and detaches himself from emotional situations by teaching Minou to look to logic and history. Despite coming across as distant at times, there’s something in the way Minou talks about him that somehow makes it clear that his daughter feels his love all the same. 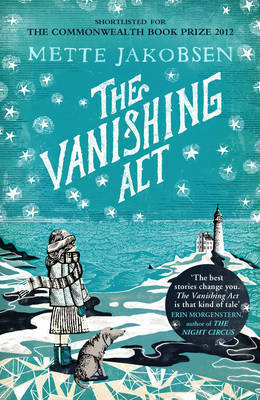 Thinking about it that way, The Vanishing Act is actually a rather clever bit of writing. There wasn’t a single character in The Vanishing Act that my heart didn’t hurt for at some point. No Name included. It’s partly because of the eerie, windswept setting but mostly because of the whimsical way in which Minou ponders her surroundings and neighbours. Her refusal to accept that her colourful, creative mother could do anything so mundane as die kind of broke my heart. Using a child as a narrator can often seem gimicky but in The Vanishing Act, it does actually add something. There’s as much in what Minou doesn’t pick up on as there is in what she does. Both of her parents seem to have experienced their own tragedies during the Second World War but, in an effort to protect Minou from the horror, only allude to them. There are plenty of moments where the subtext is clear to an adult reader but which remain a mystery to young Minou. It means that we really only skim the surface of the stories that make up the inhabitants’ lives but that’s far more realistic than having a young girl suddenly latch on to the truths behind the adults’ behaviour so I will stand by the conclusion that it works. I didn’t feel as though the story was supposed to be about the residents so much as about one girl’s experiences, hopes and fears. I suppose you could criticise the story for being a little vague or for there not being much of a plot, as such. If it were longer, I might be inclined to agree but at only a little over 200 pages, I was happy to sacrifice action for a little while and meander around a remote island getting to know its residents. Kind of like going for a stroll in some beautiful countryside after spending too long in a city. Overall: A wonderful little book that would be perfect with a mug of cocoa over a snowy evening or two. And I know that there are plenty of those around these parts at the moment so you have no excuse!